The original building with its three floor levels and tower was constructed in 1879 and named “San Jose”, by Joseph (Jose) Guillermo Hay, an official in the Lands Department, who had received a grant of 300 acres at Lawson the previous year. In the 1880s Hay took advantage of the Mountains’ new and growing reputation as a health and recreation retreat, and by 1882 the name “San Jose” had the words “The Blue Mountains Sanatorium” added to it and described in a local guidebook as “the best for private families” and “with grounds laid out with romantic paths in all directions”. 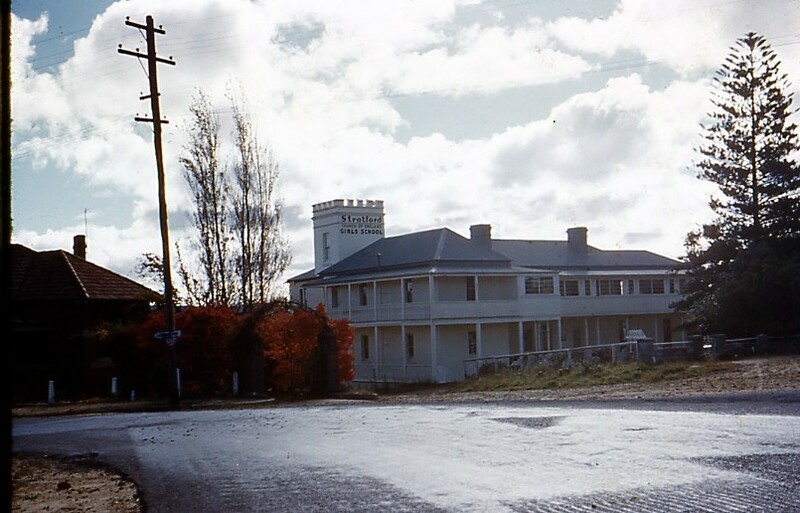 In 1889 Hay applied for a publican’s licence for the property then known as “Hay’s Family Hotel”, described as having fourteen rooms for public use. 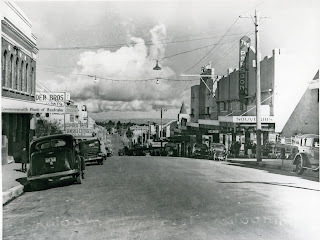 During the 1890s the property was acquired by John Ralston who ran it as a guesthouse known as “The Palace” for the next two decades until, in 1919, it eventually took the name and function for which it is best known. The original Stratford School was founded in Lawson in 1915 by Miss Effie Townsend Wiles, known as Edith, who began classes with six pupils in a rented cottage named Tahlia, on the Bathurst Road as the highway was then known. By 1919 the old cottage was “bursting at the seams” and a move became imperative. The school made the move across the highway and railway line taking the name “Stratford School for Girls” with it. In 1924 Miss Wiles and her sister, who was also a member of staff, purchased the building from the Ralston estate and were then able to make additions and alterations to accommodate the school. When Miss Wiles died in 1930, the enrolment was 49 girls of which 31 were boarders, five girls sat for the Intermediate Certificate exam and two girls sat the Leaving Certificate. Control then passed to the Stratford School Council and subsequently, in 1936, to the Church of England, and the school entered its heyday as “Stratford Church of England School for Girls”. “The development of capable Christian gentlewomen in an exceptionally healthy, bracing and invigorating climate” - that was the promise of Stratford School, to prospective students and parents in the 1940s-50s. According to a 1950s school prospectus, boarders at Stratford enjoyed an atmosphere of individuality and co-operation. Pupils were “fitted for practical business”, whilst encouraged to regard life from the stand-point of high ideals and to further their studies at the university. Stratford’s curriculum, extending from primary to leaving certificate, included scripture, English, history, geography, French, Latin, mathematics, physiology, biology, business principles, book-keeping, art, handicrafts and speech training. Music and singing also featured as an important part of school life and students could choose to sit for Australian Music Examinations Board grade exams. The girls wore an attractive grey uniform, but jewelry was strictly forbidden, with the gracious exception of the school badge and a wrist watch. Money was also controlled, with all funds going to a pocket money account. Statements on expenditure for outings, church collections and incidentals were issued to parents. There were three school terms, each 13 weeks long, though the girls were allowed one weekend mid-term to visit relations or friends. Travel to and from Sydney for vacations and mid-term holidays, was always supervised by a mistress from the school. During term, visitors were allowed, by arrangement with the headmistress, but no student could accept invitations without written permission from her parents. Non-vacation weekends were devoted to healthy activities and visits to places of interest in the district. As with most Mountains boarding schools of the era, great emphasis was placed on fresh air, healthy diet and wholesome activities. The dining room menu boasted copious quantities of fresh fruits and vegetables, home¬made jams and preserves and plenty of milk. Prospectus photographs showed bright, healthy young ladies, poised with grace and decorum in the dining room, clearly enjoying their healthy, wholesome meal. Recreation was also high on the list at Stratford with tennis, netball, Vigoro and swimming at the nearby Lawson Pool offered to all pupils. The girls were accommodated in bedrooms for two and four boarders and there is also mention of a fine glassed-in balcony with an eastern aspect which appears to have housed a few beds as well. During the winter, swimming lessons were abandoned and wood fires were lit in the assembly hall and classrooms. Stratford girls, unlike their counterparts at Osborne College, Blackheath, were also afforded the privilege of a hot water service. The prospectus makes no mention of students’ academic records, but in the early 1950s, following a report by the Department of Education; the school was reduced to Intermediate Certificate level. The 1957 fees brochure shows that the Leaving Certificate had been reinstated and announced the launch of a building fund to raise ₤5,000 for the erection of new and modern classrooms and to “gain help for Stratford to develop along modern lines.” Two coaches from the Lawn Tennis Association had joined the staff to provide coaching to pupils for which a fee of ₤2.10.0 per term was charged. 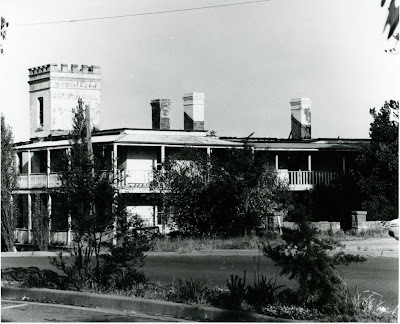 It appears however that all this was unsuccessful, so with the buildings and furniture run down, changing trends in education and competition from Public schools and other private schools such as Blue Mountains Grammar at Wentworth Falls - Stratford finally closed in 1961. In 1966, the building was sold to a Sydney couple, who refurbished the interior to house wedding receptions, dinners and private patties. The establishment lasted until the late 1970s, when in 1977, the Blue Mountains Community School moved in with 18 students, a new teacher and Government grants for a library and mini-bus. By 1980, the building was owned by brothers Lionel and Vivian Coleman of Sydney, but there would be no more tenants for Stratford. On June 4, 1980, as the result of an electrical fault, the building was gutted by fire. Today, the only reminder of Stratford’s former glory is a large stenciled sign on the building's tower, the rest has gone. The remains of the building, except for the tower section, were demolished by a developer in the early 1990s. No further move has been made, at the time of writing, to develop the site, which is listed on the local heritage register. In 1915 the first home of the school was the rented cottage Narbethong on Bathurst road, then until 1919 at a house named Kawarree, later known as Tahlia House, situated near the Lawson Community Hall. In 2008 Talia was threatened by road widening plans for Lawson and was re-sited back from the highway alignment by the RTA. While the school occupied Tahlia, in 1916, Woodford resident Toranosuki Kitamura, manager of Kinematsu (Australia) Ltd, imported a Yedoensis flowering cherry tree which he planted at the school as a token of respect for the high quality of education his three daughters, Jean, Una and Beth had received. The tree thrived for many years but due to its age and poor health could not be moved to make way for traffic. However over 100 young trees were successfully propagated from cuttings which are to be incorporated into landscape plans for the new highway and town centre. In 2002 a farewell ceremony for the old cherry tree was organised by a former Stratford student from the 1940s, Mrs Kathleen Hooke nee Barwick, and attended by the Japanese Consul General, the Mayor and the Member for Blue Mountains, local councillors and the grandchildren of Mr Kitamura. Effie Wiles, the daughter of a Methodist Minister, the Rev Henry Wiles, was educated at the Maitland High School and at Burwood Methodist Ladies’ College. In 1908 she opened a small school at Lawson, in a cottage called Narbethong. At first there were six pupils, but it was not long before larger premises became necessary and Miss Wiles opened the school in a larger cottage named Kawaree, and it was she who chose the name ‘Stratford’(SMH April 1930). 1919 – Move to the building in San Jose Ave.
Miss Wiles and her sister moved from the rented house to Stratford School for more class rooms. Later teachers were Mrs Senga Erratt, nee Rose, a pupil of Miss Wiles and also a gifted musician and a triple certificated nurse; Mrs Tibbits (nee Plummer) and Lady G. Cassidy, nee Waterhouse, a former Stratford School captain, were pupils of Miss Wiles. In l936, the Rev Barwick was asked to leave the Kurrajong Parish and to come to Lawson to become the Treasurer of the Stratford Council. In the same year, the Archbishop, the Most Rev HWK Mowll D.D. asked Miss GML Watkins to consider becoming the Headmistress of Stratford School, she ‘graciously consented’ to accept the position as Headmistress. Miss Watkins exerted a unique presence throughout the school by her kindly smile, a quiet nature and yet maintaining strong discipline and by her long and saintly leadership, as well as her Sunday evening ‘Devotions’ conducted by her in her lounge for the Boarders with discussion of problems and the sermon of the Rector delivered at the Church that morning. All helped to ‘mould’ the school together into a ‘more or less’ unified whole. She had been in charge of the ‘Holmer’ School, in Parramatta for about 10 years (1915 -1925) and then there is a break between 1925 and 1935. She may have gone to Bedford College, London to do extra teacher training there. She started at Stratford Girls’ School, Lawson early in 1936. Senior School: Miss M C Day, Miss Jean Frazer, Mrs A L Gorrod, Miss A. Howard, Miss I A Sawkins, Mr Bernard Schleicher BA Oxon. (languages, mathematics, history, ref. John Low). Junior School: Miss Blaikie, Miss B M Holt, Miss R Missing and Miss G E Waring (ref. Autograph Book of K H Hooke). 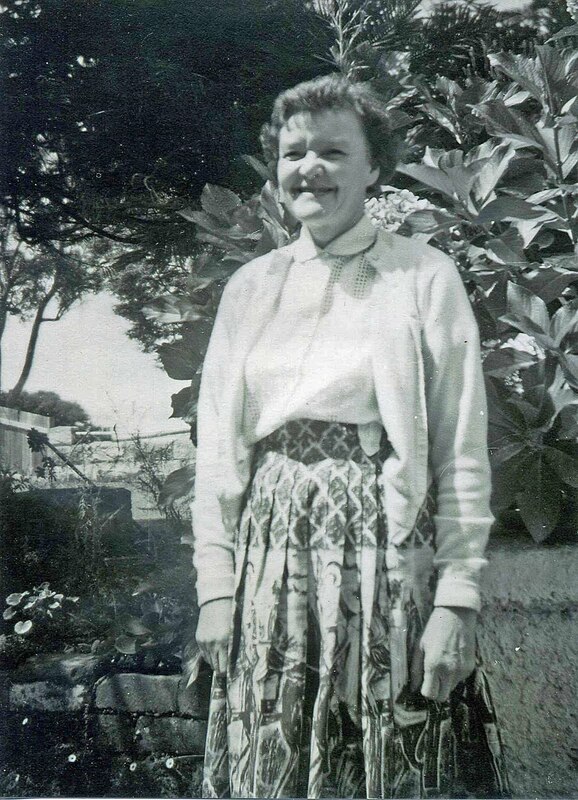 The Assistant Headmistress, House Mother, Music Teacher and Matron was Miss Lilian Murray, from Wellington and Kelso, who was at the school in Miss Wiles’ time and then continued till 1952 and died on 23rd June 1953, age about 24 years. headmistress was chosen. On her staff: were the following Miss Adam, Miss Carnarole, Mrs Eastman, Miss Graham, Miss Daphne Kellet (3rd Class Art and Drama, Shakespearean plays), Miss Parr, Miss Thomson and Miss Nancy Walsh (ex C.M.S. India). 1956 (1st and 2nd terms) MISS Mary THOMSON B.A. Work greatly appreciated by the School Council, lived out of the school grounds. 1956 (3rd term) Mrs Deirdre HAYTER The Council acknowledged that she had worked untiringly. 1957 (January) 1959 Miss Judith THEWLIS, B.Sc. Dip.Ed. And the blue sky is arching above. The school that we honour and love. Gold for the sunshine and blue for the mountain tops cold. For the duties that close to us lie. We all can be useful and kind. The treasures of spirit and mind. Heads high we shall smile and press on. Our school days at Stratford are done. 1: Stratford ruins after the fire, photographed by Neil Billington(1983) for Blue Mountains City Library. 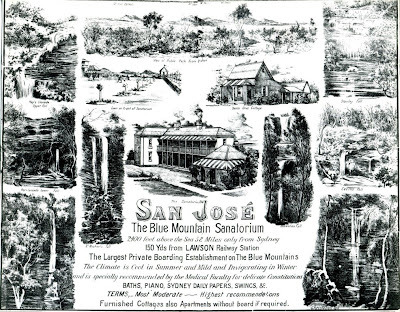 2: Advertising poster for San Jose, The Blue Mountain Sanatorium, note Blue Mountain was the earlier name for Lawson from the 1840s until 1879. 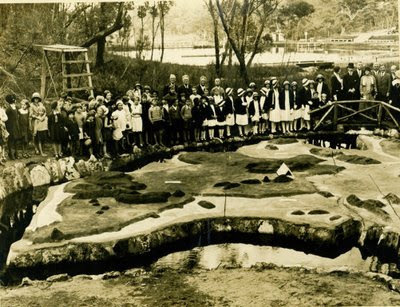 3: Stratford girls in uniform (centre) at the opening of the relief map of Australia at Lawson swimming pool 1932, Lawson public school pupils on left and Percy Wilson, Blue Mountains Shire President, in bowler hat with his wife on the bridge; a Stratford mistress appears to be with them on left of bridge. 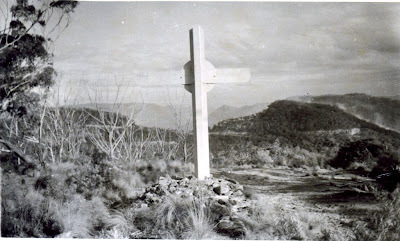 The cement model was constructed by Mr Frank Higgison (1909-1943) of 35 Allen St Lawson, who was to die on the Sandakan Death March on Borneo. Frank may be present in the photo, he would have been about 23 at the time. 4: Stratford about 1960, colour slide by Milton Porter from the Local Studies Collection. 5: Miss Judith Thewlis, photo courtesy Mrs M E Patrick, Local Studies collection. Thanks for Brian Fox for this reference. Further helpful information regarding Miss Wiles was supplied by Nancy Donald. My family - mother, 2 daughters, 3 sons, moved to San Jose Avenue, Lawson, in February, 1942. My eldest sister travelled to & from work in Sydney on "The Fish" each day, while my next eldest sister, my older brother & I travelled to Katoomba to school each day. My younger brother was too young for school. My father & eldest brother were both in the Army. I enjoyed Lawson, though freezing in winter, & could be very hot in summer. Looking back now, our house only had tank water & a wood stove, but that was true of all the houses up there then. A great place for kids to grow up. I was a Stratford boarder in 1960-1961 and have many memories. Miss Judith Thewlis was headmistress until her death in 1960 and Miss Maureen Bannerman became headmistress in 1961. I remember swooping bats on the slopes, freezing cold shared 3 minute showers down in the dungeons, no heating after 3pm. The food was appalling, so we all filled up on bread and jam that came in big tins. Melon and lemon jam. Cold grey fried bread and tomato sauce for breakfast. Yuk. The girls had a lot of fun tormenting Miss Bannerman (nicknamed Ascot Aggie because of her brand of cigarettes) who did not cope well with the demands of running a school and was unable to attract and retain teachers. Not one girl in my 1961 Intermediate Certificate class managed to pass. I was fortunately able to get myself expelled, and so had two months at a new school to learn two new subjects and work hard enough to pass my exams. I am grateful to Miss Thompson, who was a superb English teacher. I am grateful to Miss Thewlis, who taught us exquisite table and social manners, and I am grateful to Stratford for my ability to stand up for myself. I wonder what became of Miss Thewlis's wishing well? We lived across the road in 2 San Jose Ave. The School was burnt down and fenced off. But my friends and I knew away in to explore the old School. Although abit dangerous, it was the best place for hide and go seek. The dungeons underneath were abit to scary though. Its probably fair to say I hold the last happy memories of the place, before the Counsel demolished it in the 90's. Its amazing that the internet joins all the peaces together from an amazing place in the Mountains. I have received the following information regarding Miss Effie Wiles, from Nancy Donald, whose husband is a distant relative of Miss Wiles. Thank you Nancy. My husband Alan Donald is first cousin twice removed of Miss Effie Townsend Wiles. Effie (1878-1930) was one of eight daughters of Rev Henry Wiles (1841-1919), Methodist Minister, whose sister Marion married George McGarvie Donald, first Mayor of Lithgow. George is Alan's great-grandfather. I have been interested in the story of Stratford School, since corresponding with Mrs Kathleen Hooke from 2000 until her death in 2009, but I have not yet seen her memoirs (self published in 2008). There are errors in the BLOG of April 2009 : It was not Edith, but Effie Townsend Wiles who founded Stratford School, its original name being Blue Mountains Girls School. 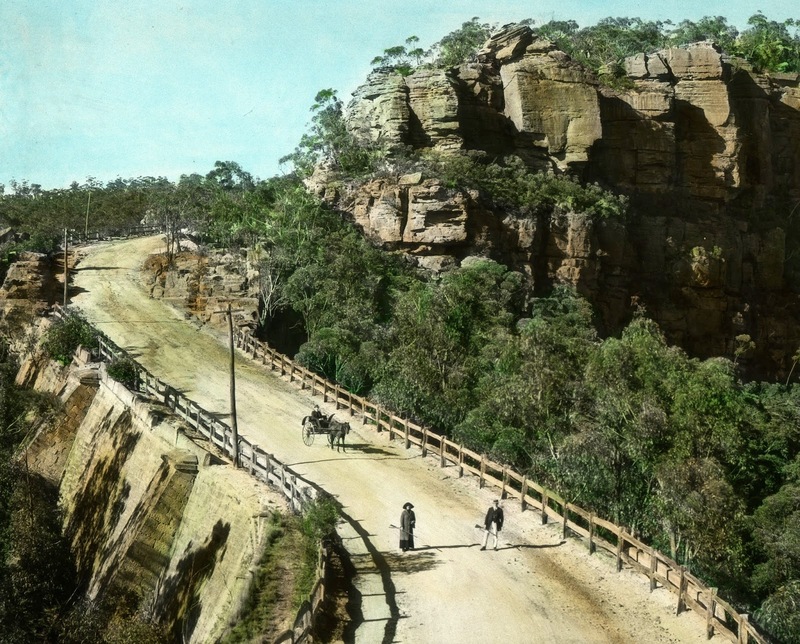 From my searches on TROVE, I find the first references are in "Nepean Times" of 4/6/1910 : "Tableau arranged by Miss Wiles", and then 15/10/1910 : "Pupils of Blue Mountains Girls School, Miss Wiles, Principal, and Miss Dorothy Wiles...."
Then in "Blue Mountains Echo" of 30/12/1910. "Miss Wiles is to be congratulated upon the success of the school, which has been under her direction for 3 years". That first small school was in the cottage "Kawarree", later "Tahlia" which building has in recent years been moved back on its plot of land to allow for the road widening. In "Nepean Times" of 23/9/1911 : "Pupils and friends of Stratford School.......Miss Ethel Wiles, accompanist." In "Blue Mountains Echo" of 24/5/1918 : "Recital organised by Miss Alice Wiles and Miss Vera Plowman,both of Stratford Girls School." Miss Wiles (Effie) certainly had sisters with her at the school. Two of her sisters were Ethel Harriet and Edith Eveline, and two of her half-sisters were Dorothy and Alice. All of Henry's children were born in Australia, in the various country towns where he was at the time the Methodist Minister. Effie was born in Hay. "Ethel Harriet worked alongside Effie, and the two of them purchased The Coffee Palace which they turned into Stratford School for Girls. At first they rented it from John T Ralston, then bought it from Estate of the late John Ralston in 1924 for 2250 pounds." This quote is from a letter to me in 2002 from Heather Mollenhauer, sometime historian of Lawson. Heather died in 2010 - we knew each other from our schooldays in Melbourne. An obituary for Miss E.T.Wiles in SMH, 3 May 1930, page 19, includes a photograph of Effie Townsend Wiles. She had been a boarder at Burwood Methodist Ladies' College in 1897-98. MLC School archives reveals that she enrolled there on 27 January 1897, age 18. Her address was Parsonage, Tamworth, where her father lived at the time. In the Old Girls Column of the MLC school magazine for July 1906 is a note "Effie Wiles is now teaching at Mrs Stiles', Normanhurst, Ashfield."